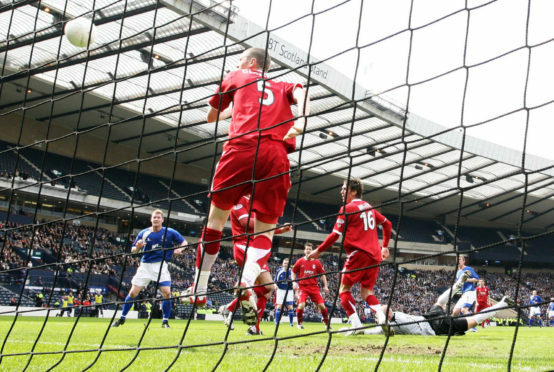 Steve Tosh reckons Queen of the South didn’t get enough credit for their Hampden humbling of Aberdeen in 2008. The former Dons midfielder was part of the Doonhamers team that defeated Jimmy Calderwood’s side 4-3 thanks to John Stewart’s winner. Tosh, who played at Pittodrie from 2003 to 2005, said Queens went into the semi-final confident they could cause an upset. He said: “I think Aberdeen fans have got a lot of that day wrong. “I didn’t think the Aberdeen team was that strong at that particular time. “We went into the semi-final firmly believing we had a chance. “We watched Aberdeen on the Monday beat quite a weak Falkirk team 1-0. “We went into the training on Tuesday knowing we would have to play well but we weren’t facing a very strong Celtic or Rangers. “We showed the right hunger and attitude and we played well. “People sometime focus on how poor Aberdeen were but they forget how well we performed. “I hear people saying if Aberdeen had scored a fourth equaliser they would have gone on to win but my retort is always that Aberdeen scored three equalisers and we kept going up the park and scored again. “It wasn’t a fantastic Aberdeen team and it certainly wasn’t outwith the realms of possibility we could win. “We had enough know-how, experience and good players in our team so it wasn’t as big a shock as some Aberdeen fans like to think it was. “The win has been slightly tainted because people said it was luck or a fluke but I don’t think scoring four goals in a semi-final is luck. Queens pushed Rangers all the way in the Scottish Cup final before succumbing to a 3-2 defeat and Tosh says the Scottish Cup run was one of the highlights of his playing career. He said: “We got beat 3-2 by a good Rangers team, who were beaten only 10 days earlier in the Uefa Cup final. “We made a spectacle of the final and we were unlucky that day. “The boys from the Queens team still keep in touch. “We have set up a Whatsapp group for all the players in that team and it is great. Stephen Dobbie, who was part of the Queen of the South team that lined up against the Dons in 2008, will again lead the line for the Doonhamers at Pittodrie. Tosh has been impressed by the longevity shown by the 36-year-old forward, who has scored 37 goals in 31 appearances this season. Tosh added: “We used to try to get him to lose a bit of weight. “It took him going down to England to realise the ability he had. “He had to combine ability with hard work and I think it is testament to himself that he is still rattling in goals at his age. “He is probably the fittest he has been and he is looking after himself correctly.